Me on the “Big Eyes”. Also part of the mission is to collect data such as conductivity for measuring salinity, temperature, depth, chlorophyll abundance. Seabirds sittings will also be documented. Jay, a steward, checking out the action! Pearl and Hermes is the name of an atoll named after two English whaling ships, the Pearl and Hermes, which ran into the surrounding reef in 1822. The twenty by twelve mile atoll is under water most of the time. It has a rich history including shipwrecks, over harvesting of oysters, a military site for war practice, and finally conservation. Atolls are the remnants of ancient volcanoes. Over millions of years, volcanic eruptions spill magma onto the sea floor. The lava eventually becomes higher than sea level creating an island. With the surface exposed, the now dead volcanoes began to shrink and erode. Over time the island becomes very flat and barely above the water. Corals grow in shallow water around the boundaries of the island. Eventually the island erodes away only leaving the coral reefs around them and a large lagoon in the middle. Through the actions of wind and waves, sand and coral debris come together to make up small islands called islets in a few places where the original large island used to be. Ernesto and Allan ready to shoot for biopsy samples. In 2003 the Pearl and Hermes reef measured 300,000 acres. This area is home to thirty three species of stony coral. The islets provide a needed stopping and resting area for seals, turtles and birds. About 160,000 seabirds of seventeen different species nest at Pearl and Hermes. The ocean surrounding Pearl and Hermes had never been properly surveyed for cetaceans. 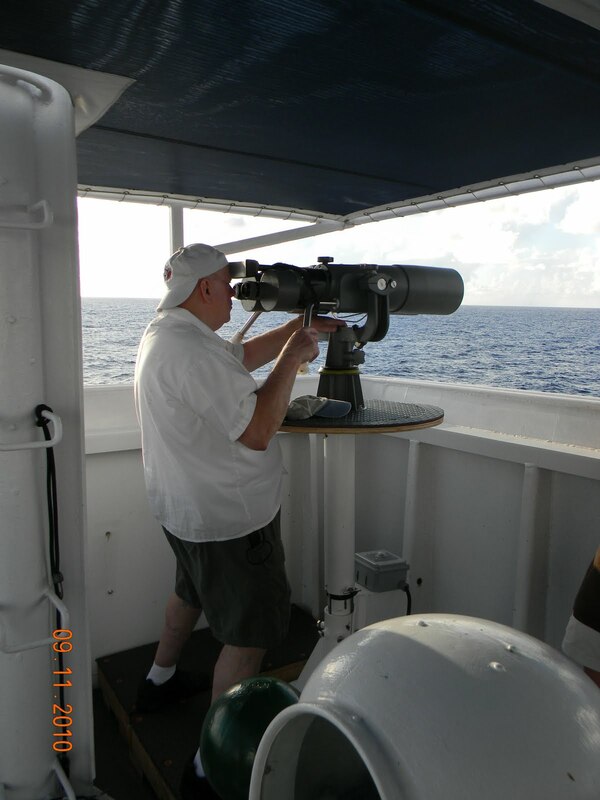 The HICEAS cruise discovered the water is also rich in wildlife, particularly cetaceans. The beaked whale is one of these cetaceans. There are twenty different species of beaked whales, but the two found in these waters were the Curvier’s and Blainville’s Beaked Whales. One way to tell them all apart from each other is their teeth. The males all have different sizes, shapes and positions of their teeth in their bottom jaw. The females and juveniles do not have teeth and need to be identified by other means such as the shape of their beak (rostrum). Curvier’s Beaked whale has virtually no beak, the melon of the head slopes smoothly onto a short thick beak. It has a sort of “fish face”. The Blainville’s Beaked Whale has a moderately long beak. The melon for the head is small and flat. Yvonne and Sussanah listening in. 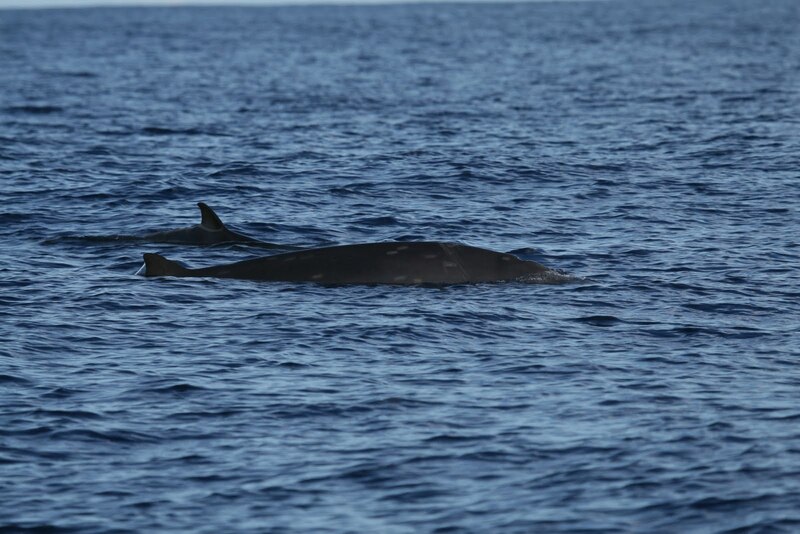 Blainville’s and Curvier’s Beaked Whales seem to have opposite coloring. The Curvier’s Beaked Whale has a white face and the white coloring continues on to the top of back. The Blainville’s Beaked Whale has the dark gray color on the back and the lighter grey on the underside. Size is another difference between the whales. The Blainville’s Beaked Whale is smaller with adult males measuring up to fourteen feet six inches and the Curvier’s whale at twenty three feet. All male beaked whales are smaller than the females, but not by much and that is unusual compared to the other species mentioned in previous logs. The past two days we have been circumnavigating the Pearl and Hermes Atoll. 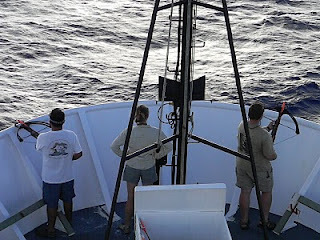 There are only two other “land masses” before we reach the top of the Northwestern Hawaiian Islands. This region has more animals than anticipated. 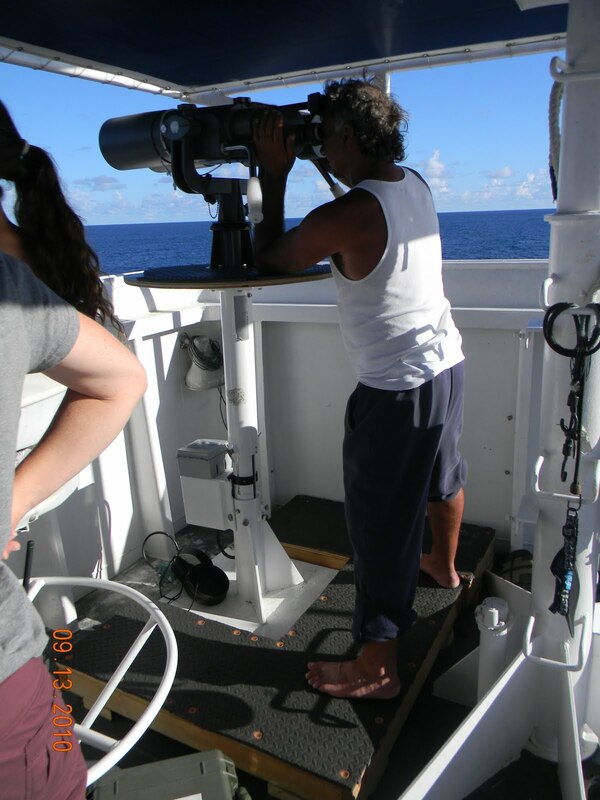 The science crew of the Sette had 16 sittings and 17 biopsy samples to report. It was a very exciting couple of days. The little boat was launched both mornings and was traveling around the atoll also, but at a closer distance to the coral on its own mission. In addition to the sightings, Yvonne Barkley, Sussanah Calderan and Niky where listening attentively to the sounds picked up by the array. The array has four mini-mircophones housed in a long rubber cable that picks up various sound frequencies. 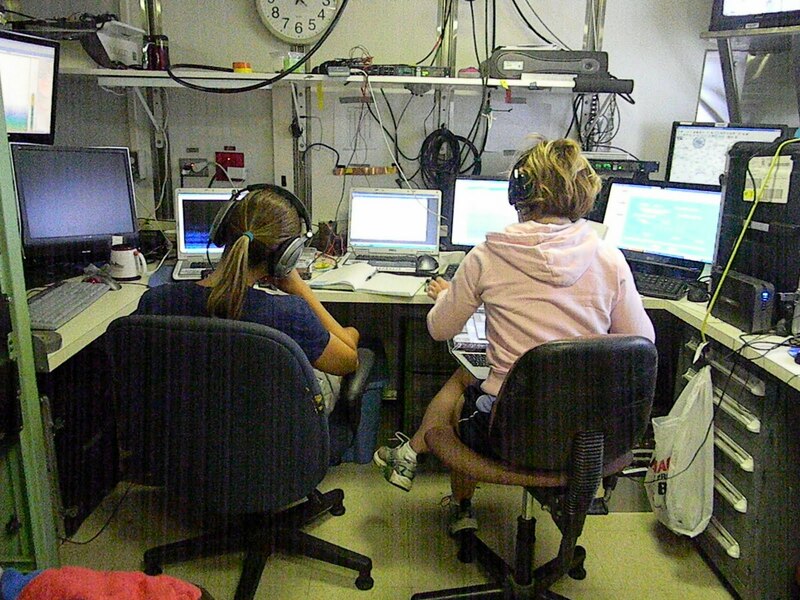 The acousticians are inside the ship recording and analyzing the sounds they hear. Working together really paid off! A lot of ocean was covered and many animals were discovered. I brought a plastic lawn chair up on the flying bridge because even though I want to write, I don’t want to miss out on any of the action. I wasn’t the only one who wanted a look at the animals, the second steward Jay came up to also take a look through the “big eyes”. I can’t imagine a boat that has a friendlier, more supporting crew! 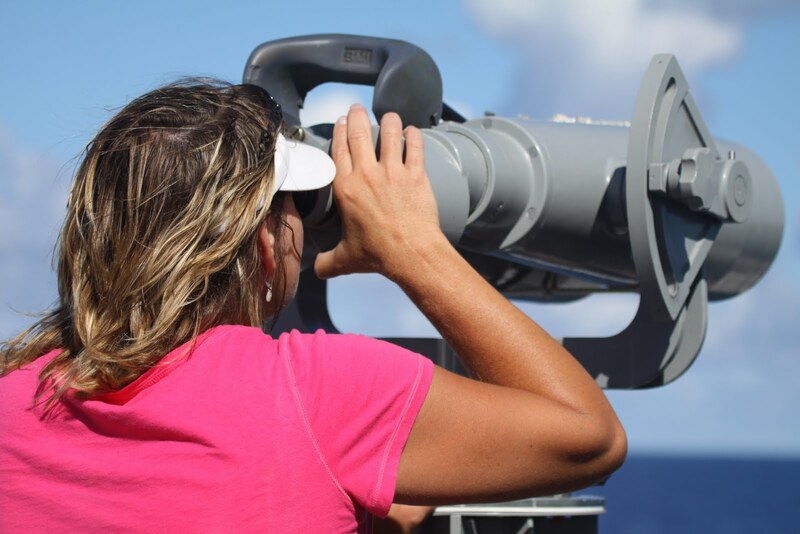 Some of the sightings included Bottlenose Dolphins, the Curvier’s Beaked Whale, the Blainsville’s Beaked Whale and Sperm Whales (mentioned in log #3), Spinner Dolphins, and Rough Toothed Dolphins (mentioned in log#2). 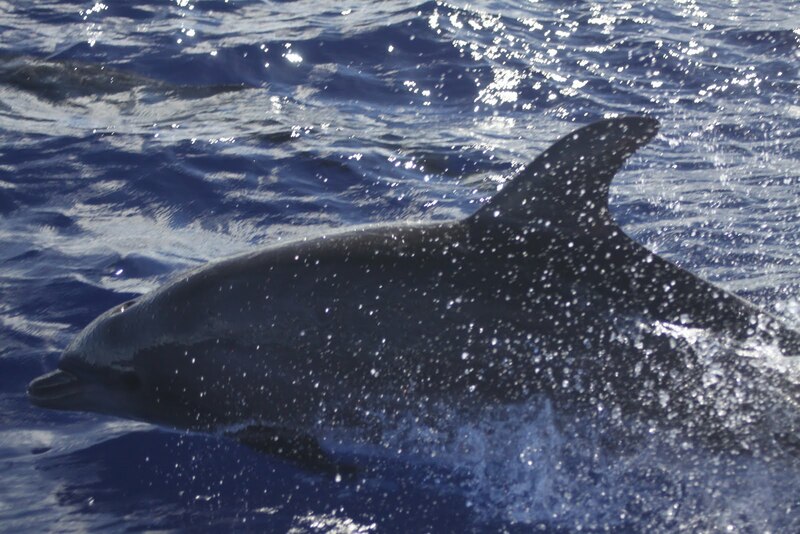 To me the most exciting part of the two day survey was when the Bottlenose Dolphins were swimming in front of the bow. At one time there were sixteen abreast. All sizes of dolphins playing and “singing” right in front of us! Their whistles were much louder than I ever imagined! The dolphins were jumping over each other and swimming on their sides and on their backs belly up. It almost seemed to be a contest on silliness. It makes your heart warm when they look you in the eye and seem to want your attention. They had my attention the whole time they swam there! I had to get up on tip toe just to look over the edge as they were so close to the rush of water caused by the ship. The group was traveling and frolicking effortlessly in front of a ship going ten knots! I stayed on tiptoe until the last dolphin drifted away to join the rest of the pack. The Bottlenose Dolphin is definitely the friendliest, playful cetacean I have seen for far! 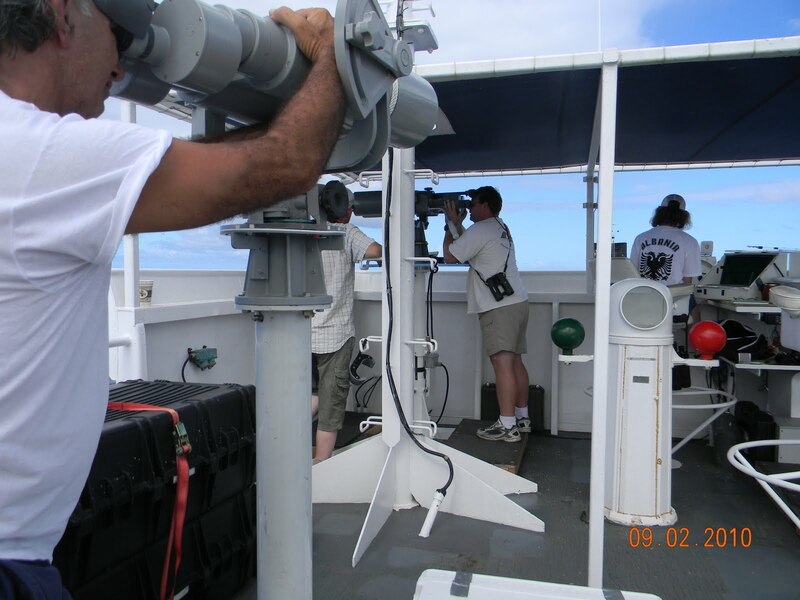 This entry was posted in 2010, Donna Knutson, NOAA Teacher at Sea and tagged and chlorophyll abundance, big eyes, biopsy, Bottlenose Dolphin, Cetacean, chlorophyll abundance., depth, Hawaii\, onductivity for measuring salinity, samples, temperature, Whale. Bookmark the permalink.